The biggest discounts, best offers, and bonuses and gifts for every taste. So many discounts that your fingers will get tired of scrolling through this news article! 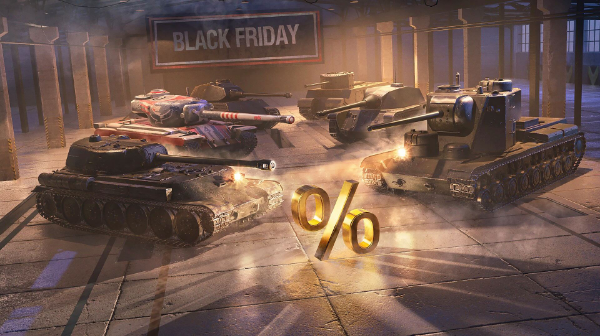 Big and tempting, like a light tank's rear for an HE shell, the week-long Black Friday sale starts in World of Tanks Blitz! Couldn’t wait to get that nose in .. Guess I’ll be able to use some of my gold from selling all of my collectible tanks. I was hoping the Löwe would go on sale, but Premium time and Rudy—come to papa. Any sales that put more Togs in the game is fine by me. I love shooting those things. A severely discounted VK 45.03. Count me in. Time to sell my ‘collector’ tanks for gold. gimme the strv, rudy and VK and ill call it good! also buying a discounted dicker max! 4 tanks for nearly free! GLAD I WAITED UNTIL THIS! yah yah.. that's great and all.. but what I WANNA KNOW!... is HOW the HOLY HECK did that TD get onto that hill at the end of the vid? Thats fort despair ain't it? Awesome sale, lots of great deals. Wasn't sure we would see X4/5 multiplier or vehicle discounts again - but instead we get them and a ton of other good stuff! My question is: Can you pay for this sticker currency with gold instead if you're short on stickers? It might be worth it to sell some of my collector tanks and get that type 64. "you will get discounts in researcheable vehicles "except the new german heavys"" ooooohhhhh what a cruel event ._. I’m just glad it’s more than crates this year. "You Get a Tog, You Get a Tog, EVERYONE Gets a Tog"
No. Sticker is the only way to get items from the showcase.